Mandir is a Sanskrit word for where the mind becomes still and the soul floats freely to seek the source of life, peace, joy and comfort. 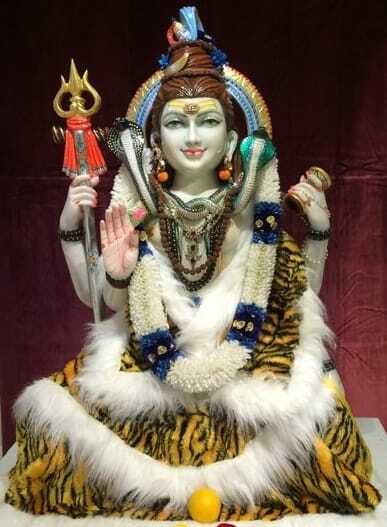 is the son of Lord Shiva and the divine mother Parvati, Gana means “discrete forms” and isha means “Lord”. He is worshipped first before any other worship services is carried out to any other deity. 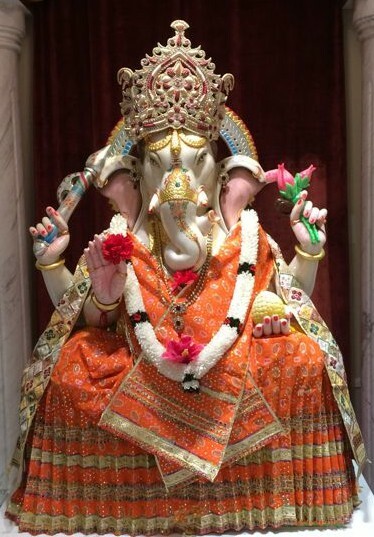 Ganesh removes all obstacles and ensures success in human endeavors. He represents wisdom and beneficence. He has four hands: in one hand he holds the noose to capture and retain obstacles or difficulties, in another he has a goad to guide the worshipper in the right direction, by removing his obstacles, in the third keep the modaka, a sweet dish, representing the fruit of devotion and with the fourth hand he blesses his devotees. means the nine planets of the Solar System and they form the basis of the Hindu astrology. The navgrahas are Surya (Sun), Chandra (Moon), Angaraka (Mars), Budh (Mercury), Brihaspati (Jupiter), Shukra (Venus), Sani (Saturn), Rahu and Ketu. The positions of these Nine grahas at the time of one’s birth are used to predict their astrological influences on an individual’s life. Each of them confer different benefits like good health (Surya). Victory (Chandra), Family prosperity(Angaraka), Wisdom(Budh), Honor (Guru), Vocal skills (Sukra), Joy and happiness (Shani), Strength(Rahu) and personal opulence (Ketu). 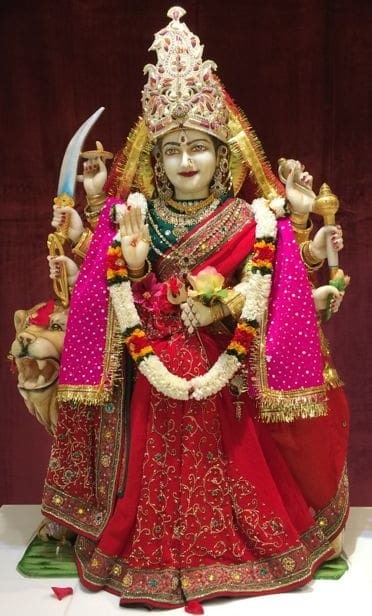 Goddess of knowledge and the arts, embodies the wisdom of Devi. She is the river of consciousness that enlivens creation; she is the dawn-goddess whose rays dispel the darkness of ignorance. Without her there is only chaos and confusion. To realize her one must go beyond the pleasures of the senses and rejoice in the serenity of the spirit. 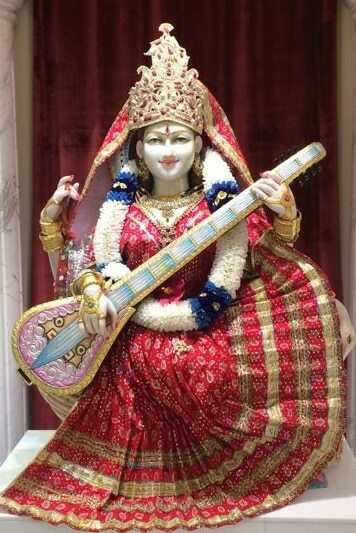 Saraswati wears neither jewels or paints herself with bright colors. The white sari she adorns reflects her essential purity, her rejection of all that is base and materialistic. She transcends the cravings of the flesh and rejoices in the power of the mind as the patron of pure wisdom. She embodies all that is pure and sublime in Nature. Represents the power of Supreme Being that preserves moral order and righteousness in the creation. The sanskrit word Durga means a fort or a place that is proctected and thus difficult ot reach. Durga, also called Divine Mother, protects manking form evil and misery by destroying evil forces such as selfishness, jealousy, preudice, hatred, anger, and ego. The worship of Goddess Durga is very popular among Hindus. She is also called by many other names, such as Parvati, Ambika, and Kali in the form of Parvati. She is known as the divine spouse of Lord Shiva and is the mother of Her two sons, Ganesha and Karttikeya, and daughter Jyoti. There are many temples dedicated to Durga’s worship in India. is “Shakti” or power. Shiva is the destroyer, the most powerful god of the Hindu pantheon and one of the godheads in the Hindu Trinity. Known by many names – Mahadeva, Mahayogi, Pashupati, Nataraja, Bhairava, Vishwanath, Bhava, Bholenath. Lord Shiva is perhaps the most comples of Hindu Deities. In Sanskrit, Linga means a mark or a symbol., which points to an inference. Thus the Shiva Linga is the symbol of Lord Shiva – a mark that reminds of hte Omnipotoent Lord, which is formless. Shiva rides the Nandi bull, which stands for the brute and blind power, as well as the unbridled energy in man – the qualities only he can help us control. His consort Parvati, Durga or Kali rides. Nandi is Lord Shiva’s mount, or vahana. This huge white bull iwth a black tail, whose name means “joyful”, disciplined animality kneeling at Shiva’s feet, is the ideal devotee, the pure joy and strength of Saiva Dharma. Aum. can be split into multiple parts in sanskrit: Ven (sins), kata(destroyer), and ishwara(Supreme Lord). Using this etymology, Venkateshwara refers to Supreme Lord who destroys sins and he is one of the main deity among 108 divya desams or Tirupathy. The ancient Vishnu kautuvam describes him as Souryarayan, the one who destroys the evil and who comforts us. He is fondly called as Venkanna in folklore of Andra Pradesh. He is also known as Srinivasa tirumalesa, Venkatachalapati, Sripathi, Thirmaal, Balaji more recent Venkateswer, Venkatesa, Venkatapathi, Venkatanatha, Sri Varu, Thiruvengadam Udaiyaan, Maal, Manivannan, Tiruvengadattaan Tirupati Thimmappa and by many other names. appeared over five thousand years ago in Mathura district of state UP (India) to Devaki and Vasudeva in the jail of Kansa. Kansa was the king of mathura and mama of Lord Krishna. The place of His birth is known as Shri Krishna Janmbhumi. 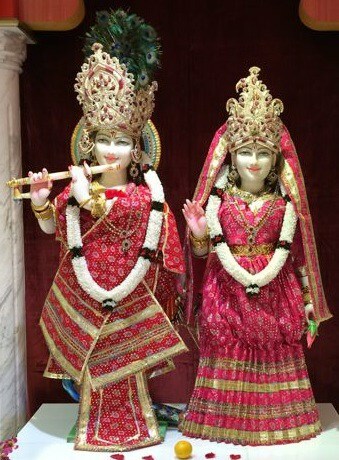 The Supreme Lord descends from time to time in this material world to reestablish the teachings of the Vedas. In Bhagavad-gita, Shri Krishna promises: “Whenever and wherever there is a decline in religious practices, O descendant of Bharata, and a predominant rise of irreligion- at that time I descend Myself. To deliver the pious and to annihilate the miscreants, as well as to reestablish the principles of religion. I, Myself appear millenium after millenium. is the most famous incarnation of God whose day of appearance is known as Rama-navami. He is known as Maryada Purshottama and is the emblem righteousness. His life and teachings of morality in office are eqully relevant for us today as 20 million years ago. He was an avatar of Lord Vishnu and he had all qualities of the all pervasive Brahman in him. He always spoke the truth and was very obedient of his parents. Due to some promise made by his father he went on an exile for 14 years just to keep the words and the respect of his father. the mighty ape that aided Lord Rama in his expedition against evil forces, is one of the most popular idols in the Hindu pantheon. Belived to be an avatar or Lord Shiva, Hanuman is worshipped as a symobl of physical strength, perseverance and devotion.